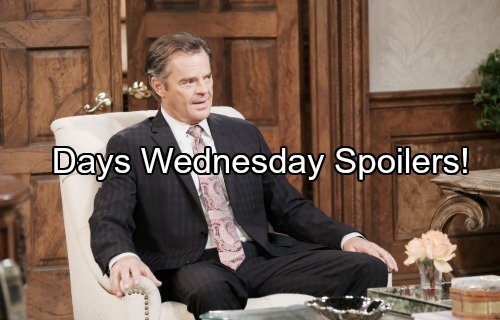 Days of Our Lives (DOOL) spoilers for Wednesday, October 18, tease that Justin (Wally Kurth) will deliver some shocking news. He’ll tell Steve (Stephen Nichols) and Kayla (Mary Beth Evans) that Victor (John Aniston) dumped Maggie (Suzanne Rogers) to be with “Adrienne.” Naturally, the decision will catch Kayla and Steve off guard. They’ll wonder if Justin misunderstood somehow. Justin will admit he thought it was a sick joke at first, but Victor and “Adrienne” aren’t budging. Of course, that’s because Bonnie (Judi Evans) is blackmailing Victor into following her orders. Days spoilers state that Bonnie will feel like everything is going according to plan. She’ll head to Mickey’s grave in Wednesday’s DOOL episode so she can reflect on the past and savor her revenge. At the cemetery, Bonnie will fantasize about how things could’ve been different. She’ll imagine some wild scenarios before eventually snapping out of it. Once Bonnie manages to compose herself, she’ll focus on her big scheme. Bonnie will love the fact that Maggie is freaking out over all this. She’ll definitely think Maggie has it coming! Other Days of Our Lives spoilers say Andre (Thaao Penghlis) will take action. Clyde (James Read) claims that Dr. Rolf (William Utay) resurrected Will (Chandler Massey), so that’s understandably bringing suspicions about Stefano’s (Joseph Mascolo) involvement. Since Stefano is no longer around, Andre will have to do his part to clear this up. He could be the key to cracking the case. Andre must understand how much Chad (Billy Flynn) and Kate (Lauren Koslow) would appreciate his help. Chad may be a DiMera, but Andre would know more about creepy DiMera secrets. Creepy is his middle name! Days spoilers say Andre will share info with Hope (Krisitan Alfonso) by the end of the week. Let’s hope it’ll be a clue that leads to Will’s whereabouts. Across town, Sami (Alison Sweeney) will need some support from her mom. She’ll turn to Marlena (Deidre Hall) for guidance and a shoulder to cry on. Marlena is also struggling right now, but she’ll try to stay strong for Sami’s sake. Will’s family members are just trying to take this one day at a time. It sounds like a great Days of Our Lives episode is on the way. We’ll give you updates as other DOOL details emerge. Stay tuned to the NBC soap and don’t forget to check CDL often for the latest Days of Our Lives spoilers, updates and news. 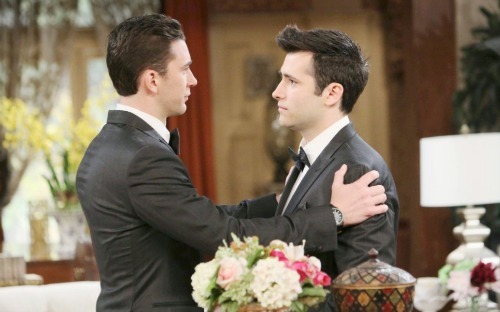 Days of Our Lives Spoilers: Shocking Storyline – Ben Redeemed – Didn’t Kill Will, but Saved Him?